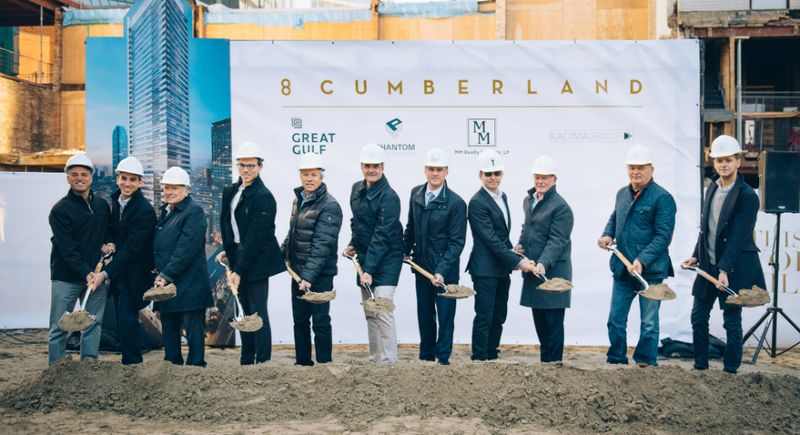 Great Gulf and its partners Phantom Developments Ltd., The Kadima Group and MM Realty Ventures Inc. recently broke ground on 8 Cumberland, a modern 51-storey high-rise condominium located at the north-west corner of Cumberland Avenue and Yonge Street in Toronto’s Yorkville neighbourhood. Conveniently located near two subway intersections, the most exclusive shopping district in Canada and a variety of cultural and art hotspots, the development’s masterplan will introduce parks and open spaces with pedestrian mews that will connect Yorkville Avenue to Cumberland Street, and eventually to Bloor Street. Designed in sculptural steel and glass by Architects Alliance with interior designs by Thomas Pearce and landscape architecture by NAK Design, the development will feature retail on the ground and second floors within the heritage brick podium, which dates back to the late 19th century. The condominium will house 371 open-concept suites ranging from 468 to 1,845 square feet, along with state-of-the-art amenities. Photo (from left to right): Ronnie Strasser, Sam Strasser, Alex Strasser, Stanton Strasser, Jay Strasser, Alan Vihant, Niall Collins, Mike McGrath, Hunter Milborne, Boris Shteiman, Josh Shteiman.